A black and white photograph of a variety show. According to Whitby Courthouse Theatre, the Whitby Modern Players presented many fine plays, notably "Blithe Spirit" and other comedies. However, the group folded and there was a hiatus in theatre activity in Whitby until 1957, at which time the Whitby Theatre Guild (W.T.G.) was born. W.T.G. presented their plays in the auditorium of the old Whitby Town Hall, which in former years was a well-known Vaudeville Theatre where Whitby audiences enjoyed many fine travelling road-shows. The very large stage offered nothing in the way of technical equipment except a row of foot-lights and an antiquated dimmer. In the early Sixties Whitby Town Hall was demolished to make way for the new headquarters of the Whitby Fire Dept. Homeless, W.T.G. spent the next two years presenting plays in Church basements, the Whitby Psychiatric Hospital, and in High School auditoriums. In 1966, the federal government encouraged towns and cities across Canada to form Centennial Committees to choose a project that would be a permanent reminder of Canada's centennial in 1967. Whitby responded, and invited certain members of the community to form a committee. Whitby's Centennial Project was the former Ontario County Administration building. After extensive restructuring, the former Court-Room within the building was converted into a theatre, complete with a stage but no seating! The Town agreed to the use of the boxwood chairs which had to be borrowed from other rooms in the building each time a play was presented. For some make-shift lighting, 5 lb. jam tins complete with lamp-sockets were assembled and used as on-stage lighting until our group could afford proper equipment. Later the name of the group was changed to Whitby Theatre Company which later had to be dropped when the group was advised that the word "Company" would be mistaken for "profit-making". It was then decided that the name Whitby Courthouse Theatre (W.C.T. ), which we continue to use to this day, better reflects the community nature of our group and the historical significance of the theatre and building. 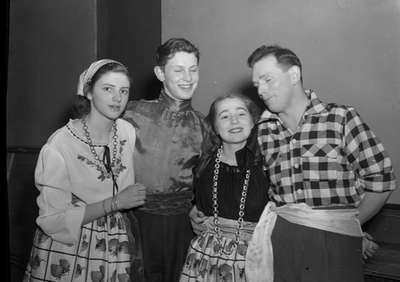 Whitby Modern Players - Variety Show 1948, Marjorie Ruddy. Whitby Archives A2013_040_1251.